Unrepentant Scribbler: New story! 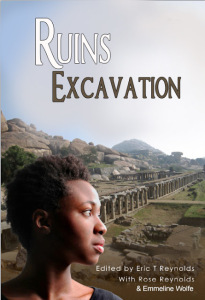 Ruins Excavation available for pre-order. New story! Ruins Excavation available for pre-order. “This is my place,” she murmured. The broken bits of pottery kept her attention until evening crept in. As shadows stretched across the site, she packed up her tools and trudged back to her camp. Late in the day, after hours stooping, the aches grew fierce. Something degenerative, the doctor told her. Genetics and environment, working together to kill her slowly. Experimental drugs slowed the progression down, but the side effects dulled her thoughts. At last she decided to make the most of what time she had. So long as she had strength, she meant to reach into the past and shake free some secrets. Too much had been lost already. Lucia rubbed at her shoulder, where a bone-deep ache settled. She was pondering what she hoped to accomplish on the morrow when a light sparkling on the canyon rim above caught her attention. A faint tang of wood smoke hung in the air. Curiosity and concern together sent her in search of the source. As night closed in, she pulled a lantern from her pack and wound the crank that powered it. Even with light, the path was treacherous, loose gravel slipping underfoot and branches scratching at her face. She skidded once, then again. But by then she’d passed the halfway point of the climb, so she decided to keep going rather than try to descend. Rich-scented sage and pungent, stunted creosote brush provided handholds, and at last she pulled herself over the brink. The muscles in her legs trembled, so she lay for a time on stone that still radiated the day’s heat. No storm had rolled through, no lightning strike could have sparked that blaze. Lucia held the lantern high and trudged forward. Anger crawled in the pit of her stomach at the halting pace that was the most she could manage. Somehow she’d convinced herself she’d have the rest of the summer and fall to work. It seemed her body had other plans.